A trip down memory lane. - A Life From Scratch. 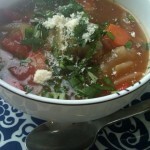 I grew up eating bowls and bowls of a mexican style chicken soup called Yucatan Lime Soup. It was made from scratch at the best little cafe in Wauconda called ‘Main Street Cafe.’ We would go there with family and friends weekly to dine over the large bowls filled with a warmth that can only be found from a really old and really good recipe. The cafe closed sometime ago (the family moved back to their home in Mexico) but the recipe never left my mind. I often found myself googling ‘yucatan lime soup’ to see if anything would come up that would connect with the memory I so distinctively had. Nothing would ever register as totally accurate. 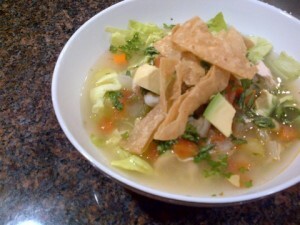 Fast forward to a few weeks ago I was enjoying an amazing soup called ‘posole’ at my dear friend’s home. Her nanny had made it for us and it was lovely. It was the closest thing I had enjoyed since my beloved Yucatan Lime soup. In fact, hers had ideas and flavors in it that would pair so well – adding hominy as well as serving it over ice cold iceberg shredded lettuce. Genius. I quickly added it to my mental ‘to make’ list. Well, after stuffing ourselves at three Thanksgivings I decided it was time to break out a fresh and light recipe, bonus that it will help out the sinuses. I researched a bunch of Yucatan Lime soup recipes online, reached out to my friend about notes from the nanny’s posole, and hit up the Mexican grocery store for the most possibly authentic ingredients. Time to experiment. The result? Wow, it brought me right back. So delicious. Cut the tortillas into strips. Heat oil on the stove and when hot fry the strips until they are lightly golden and crisp. Season with salt and set aside. Reserve the oil. 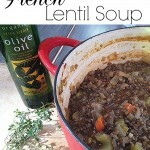 Transfer 1 TBS of the oil (discard the rest) to a large soup pot and add the chopped veggies. Cook over medium heat until soft. Add in the spices and cook until fragrant, about a minute. Add the chicken stock and chicken breasts and bring to a boil. 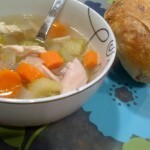 Reduce heat to a slow simmer and cook until chicken is just cooked through, about 12 minutes. 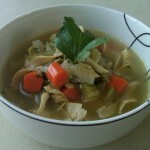 Remove chicken from the pot and allow the soup to continue to simmer. When the chicken has cooled, shred into bite sized pieces and return to the pot along with the hominy, lime juice, and green onions. Simmer until the soup is nice and hot. Cut up your ice cold lettuce and place in deep bowls. Ladle the soup into the bowls over the lettuce (I know, sounds odd but it totally works) and top with your cilantro, avocado, and fried tortilla strips. Just like the good ol days!